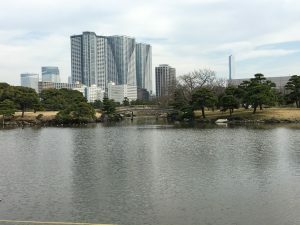 Although I can’t do much sightseeing this trip due to chemotherapy (compromised immune systems and crowded places do not mix) I’m cleared for outdoor walks, and since Tokyo’s famous Hamarikyu Gardens are only two short blocks from my hotel, I took advantage of the excellent weather and went for a lovely walk this afternoon. Hamarikyu Gardens opened to the public in 1946, but the park has existed for centuries. Originally the private hunting and falconry ground of the Tokugawa shoguns, the gardens are now a public park. The gardens contain several lakes – some of which originally functioned as duck hunting grounds. 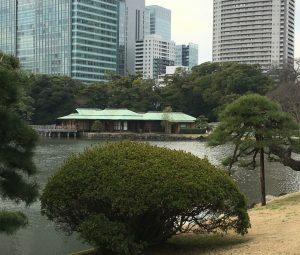 The largest, near the center of the park, has an island at its center, upon which sits Nakajima no Ochaya – a replica of the traditional teahouse where the shoguns and their visitors enjoyed refreshments (and lovely views). 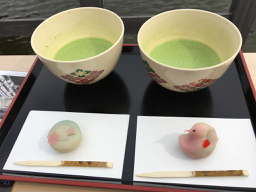 Today, the teahouse serves traditional sweets and matcha (a strong green tea made from powdered tea leaves). And the views are as spectacular as ever. The teahouse is a fantastic place to rest and enjoy the gardens. It sits about halfway along the network of paths that lead through the garden, making it an excellent “midway stop” on the visit. 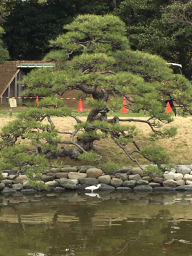 Despite having traveled to Tokyo several times, I’d never visited Hamarikyu Gardens before today – but I’ll be back. The gardens are lovely, peaceful, and doubtless beautiful in any season. Do you enjoy visiting gardens? 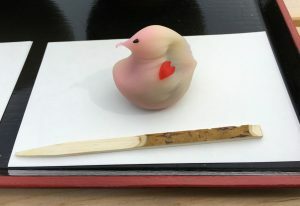 What do you think about those fantastic sweets?